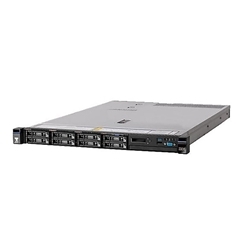 Designed in a compact, versatile 1U two-socket rack server, the System x3550 M5 rack server fuels almost any workload from infrastructure to high-performance computing (HPC) to cloud or big data with leadership security, efficiency, and reliability. Integrated with up to two Intel Xeon processors of the E5-2600 v3 product family with faster, energy-efficient TruDDR4 Memory, the x3550 M5 delivers exceptional performance. Storage can include up to 12 drives in an impressive selection of sizes and types.